Sometimes, our dentist will decide to take dental X-rays during a routine dental appointment. 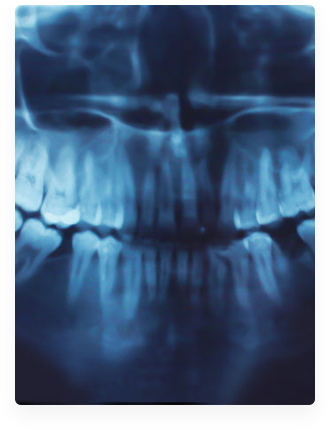 Dental X-rays allow our dentist to locate dental issues like cavities, infected dental pulp, and changes in bone density that are difficult or impossible to locate with the naked eye. Our dentist will decide how often to take X-rays based on your age, oral health, and risk for disease. Dr. Jayson C. Haws uses digital imaging in Brigham City, Utah. Dental imaging has many advantages. Traditional X-rays has film that has to be developed in a dark room, but digital imaging is sent to a computer screen in seconds. Once on the computer, the image can be saved or printed. Digital imaging uses less radiation than traditional X-rays, so this technology is safer. Digital images can be enlarged and enhanced on screen, making it easier for our dentist to spot dental flaws and to show you where and what the problem is. When needed, our dentist can send images to another dentist or a specialist electronically. Using a technique called subtraction radiography, our dentist can compare current images with old ones. Everything that is the same between the two images will be taken out, leaving only the portions that are different. This allows our dentist to easily spot even the smallest changes in your smile.